Roanoke offers guest discount parking at Legacy Parking Garage (172 W. Madison Street) just a block west of our restaurant. 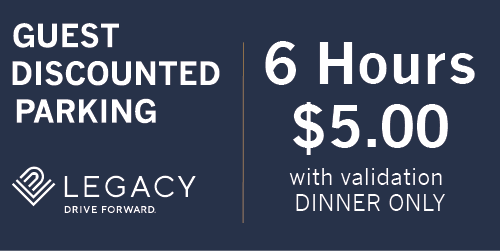 Bring your Legacy parking garage ticket and receive a discounted rate of $4 for up to six hours of parking with your dinner visit (Dinner 3pm-10pm). After six hours, normal rates will apply. Visit Legacy Parking for additional tips on parking locations and rates. ​happy hour features, menu updates and more! through the links below or apply in person 135 W. Madison Street, Mondays—Fridays between 2 and 5 pm.